I remember last year that the market for Arabica coffee has cratered so coffee is pretty cheap. People pay the $10 bucks for the name of "StarBucks". They have to be stylish you know. Interesting. Don't see where cratering bean prices have pulled down the price of trendy brands like StarBucks, tho I have seen Starbucks discounted when on sale. 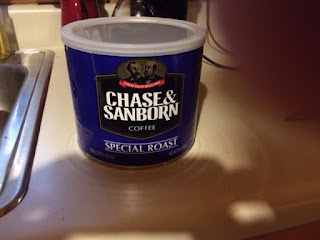 I drink my coffee black, and I'm perfectly happy drinking legacy U.S. brands like Chase and Sanborn or Maxwell House. Grandma was a Maxwell House drinker, mom and dad leaned to Chase and Sanborn. And when I open those brands up, I swear I can recall the same aromas from when I was a kid. Maybe it's all in my mind, but opening a bag of the newer, trendy stuff brings no such rush of nostalgia.